The “Literaturhaus Uwe Johnson” has found a home in a granary built around 1890. It is situated close to the market place in Klütz, a charming small town in Mecklenburg, East Germany, close to the Baltic Sea coast. The listed building hosts a permanent exhibition about the writer Uwe Johnson, the city information and the town’s library. As a forum for cultural activities the house introduces its visitors to the fascinating world of literature and presents all information ostentatiously. Readings, discussions, movies, exhibitions and workshops make it an attractive venue in Klütz where visitors with special interests in culture and literature can get together with their equals. The “Literaturhaus Uwe Johnson” is one of the few houses dedicated to a poet or writer without being his or her birth house or house of residency. However, in light of the text references to this site in Johnson’s works, the historic granary seems predestined to be a literature and tourist venue. Stretched over two floors the exhibition in the Literaturhaus provides a complex glimpse into the life and work of Uwe Johnson. It vividly reflects the work of an artist who remained closely connected to Mecklenburg throughout his lifetime. The county and its cities as well as its breathtakingly beautiful fields, forests and waters came to be one of the most important landscapes in Johnson’s literature. Multimedia presentations, excerpts of his works and drawings of the typical Mecklenburg countryside introduce the visitor to Uwe Johnson’s world. 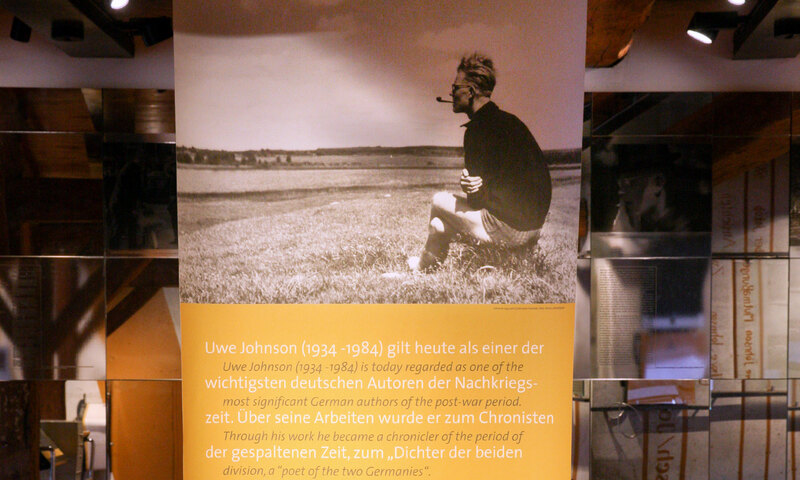 Contemporary witnesses such as Max Frisch, Günther Grass, Walter Kempowski and Siegfried Unseld complement the exhibition with their comments on the personality and importance of Uwe Johnson.